For the chicken Put the chicken in a slow cooker. Blend the garlic, chipotle pepper, vinegar, oregano, lime juice, salt, pineapple, and ancho chili powder in a blender. Blend on high until all ingredients are well-combined. Pour mix over the chicken. Cover and cook at high temperature for 3 1/2 hours, or until the chicken shreds easily. Turn off the slow cooker, shred the chicken, and allow to rest for 5 minutes so that the meat can absorb the sauce. To serve Warm up the tortillas. Place a little of the mix into each tortilla, add pineapple, onion, cilantro, and sauce. Sprinkle a few drops of lime juice and enjoy! If fresh pineapple is not in season, you can use canned pineapple, both for the marinade and to serve. To give it a little more heat, add a serrano or habanero pepper to the marinade. In Mexican cuisine, the term “al pastor” refers to a marinade made with chilies, pineapple, vinegar, and spices. Tacos al pastor are traditionally made with pork grilled over an open flame. However, the al pastor marinade can be used with any type of meat. Chicken is perfect because it absorbs the sauce’s sweet and sour deliciousness, and it takes less time to prepare. 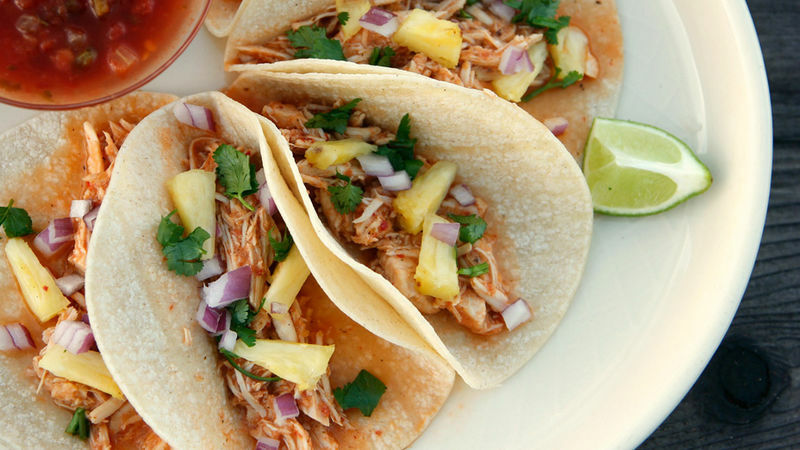 This recipe for tacos al pastor couldn’t be simpler. Just put all the ingredients in a slow cooker. Set your alarm, and forget about it. Your family will love it.